Taken in my kitchen! Incredible, huh? 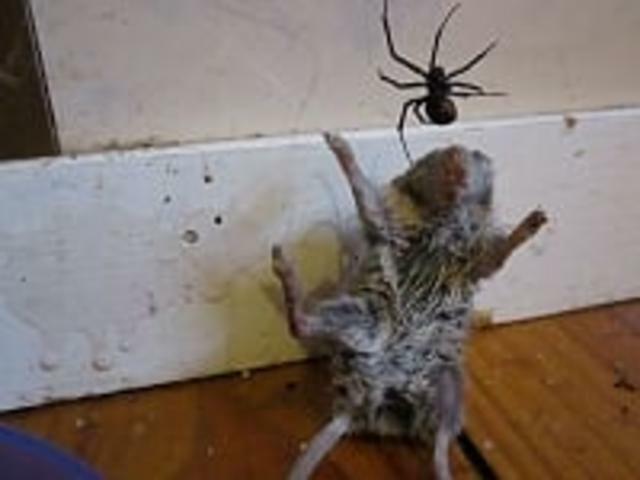 Do you think the spider killed the mouse? Yes Randall. Definitely! The mouse was caught in the spiders web. Also look how sweaty he was. His body was trying to secret the spiders venom, it obviously didn't work. I have never seen anything like it in my life! It was quite sobering, yet at the same time amazing! Yes Randall. Definitely! The mouse was caught in the spiders web. Also look how sweaty he was. His body was trying to secret the position, obviously didn't work. I have never seen anything like it in my life! It was quite sobering, yet at the same time amazing! yeah, well, they are more than capable. Their bite knocks people around. That will keep the spider going for a long while , at least through winter. Then he might start eyeing you off. I hope you left him with his mouse. None of his mates will ever believe him otherwise. Redbacks are nasty things and have a quite a number of them here. Begining of summer give a spray of spider killer to keep them under control along with various assorted funnel webs and trapdoors. Yes they sure are. I would not want to get bitten by one of these things. In the mid 1980's a friend of ours took plastic deck chairs out of his shed one day when we were around for drinks one hot summers day. A Red Back bit him on the backside! He spent the whole day in Emergency & 5-7 days sick as a dog in bed! As a pest controller technician of 25 years, I have to say that this is something that I have never seen before. Mice and other mouse sized marsupials often come into contact with redback webs, because they often web at ground level, and where mice travel. 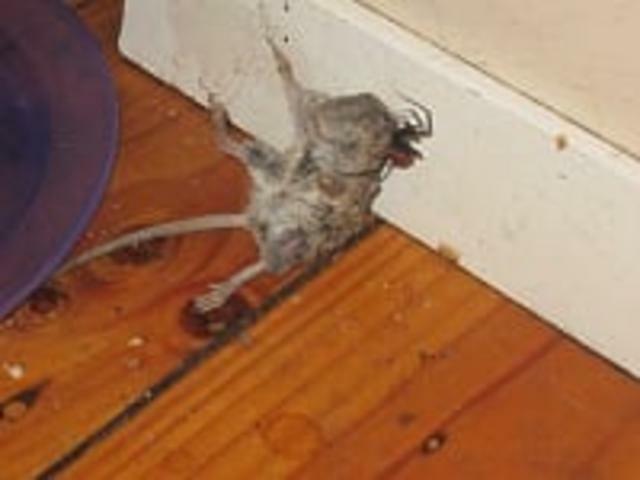 Mice can easily be killed by a small amount of redback venom. Do you have any baits around the house. Just wondering why the mouse was too weak to get out of the web, could be even a neighbour baiting. Just a tip though. redbacks are pretty handy to have at home as they kill most other pest insects. I never kill them at my house. Don't tell anyone I said that though. I have been bitten 4 x now at work, and it was a very different experience each time, from sick as a dog to a bit like a bull ant sting. Its always a bit disturbing when an invert takes one of "us" vertebrates. You summed up exactly what I was thinking!! I read somewhere a woman found her cat dead with a Red Back in its mouth in a web. I also saw footage of a 'sizeable' brown snake (about 2 feet long) caught it a Red Back's web then killed- its on you tube live. I think the spider runs down and bites its prey, then retreats, before it has a chance to free itself, this is particularly the case for larger prey, but its rare. The spider can also spins web-jackets from a distance and sometimes coat the animal in a thin sack of web (a tomb). I noticed this can be really hard to see. This mouse looks almost mummified, especially near the head- I don't know if this is the web or the poison acting within its body- my guess is its a thin web as the mouses hair cant carry poison? This is quite horrific too look at! Reminds me of the Alien movies. So from what I have seen I don't think the web has to hold the prey forever, it just needs to hold it momentarily, enough time for the spider to bite! BUT I have also noticed spiders are a lot more cautious when it does this- meaning I think it is a rare event, especially with larger prey, but it obviously can and does happen! I couldn't believe it when I saw this & my family came around and saw it also and were all equally amazed. Another thing I noticed is red-backs rarely come inside the house, but when they do they have always made their webs right near my pets food and water, which is where this one was! I think this is intentional and is amazing. One reason I never leave food lying around the house! Sorry pictures are not clearer. I used a (standard) Canon Power Shot camera. If you look at the width of the floorboards, I had to get my head extremely close, perhaps less than a foot away from the spider. I think he could even sense the heat from my breath as he got nervous at one stage but only a little as I was very cautious, so I had to hold my breath & move very slowly, when all the instincts in me wanted to do it quickly! Imagine if they were the size of a huntsman spider, they would probably kill us! This is what is really happening. Dr Who .